After the devastating storm on Tuesday (8/13/2018) morning, we found our neighbors in Hector, Lodi and Sheldrake particularly affected. Much is documented about this, so we will leave it to our local reporters. Next up in trickling effects was the canceling of Phish's 4-day music fest in Watkins Glen due to water quality issues. This left vendors all over the region scrambling with inventory and staffing. We teamed up with 2 of those vendors- Silo Food Truck and Copper Horse Coffee- to try to bring some action to all that food and some conversation to the relief effort. On Sunday, August 19, the Cider House closed down our kitchen and gave all food service over to Silo and Copper Horse. We rounded up our dear friends from TOiVO and The Flywheels for a little rousing music and went into the day with hearts full and a great amount of unknown. We sought to provide a place for the Flood Relief Conversation to happen, and evolve. The Willard Lion's Club, Lodi Fire Department and STEPS offered to staff the donations/info area, and we were off! All day we were joined by folks looking to plug into the relief effort. The options were there- Buy from Silo and 50% of proceeds went to the Sheldrake and Lodi Relief Funds. Volunteer via the Lion's Club. Donate needed items straight into the Lodi Fire Dept. trailer for distribution. We'd say, as a first-responder, farmer-developed-in-24-hours sort of benefit that yes, it felt successful. This is only the beginning! In cash, the Cider House, Silo Food Truck and individuals using our online Donate Button are donating over $4,000 split between the Lodi and Sheldrake Relief Funds. Silo also served around 700 free meals on Friday and Monday to Relief volunteers. You can still donate online, via our Donate Button. Some of the best ciders we have made are from pears. Unfortunately, our Perry Pear trees are young, few and fickle. But 2015 was not only a wild apple year, it was an on-year for wild seedling pears. They stood out in the fields and hedgerows in and around Van Etten. Ben Kahn, who also picked wild apples for us in 2015, made his fortune in pears. His luck is that we found that virtually all wild pears make great cider fruit, so there wasn’t the picking, mulling over and going back process that layered the wild apple project. The wild pears were, to a tree, shockingly tannic; those tannins emerging much softened in the cider. Fermentation also seemed to transform the fruit from cool, closed-up packages to brilliant aroma wheels. Another boon for Ben was that some of the wild pear trees were huge. From one unusual tree alone he picked 40 bushels. I wouldn’t have climbed up there, but Beni Kahn looked happy enough swaying around high above the ground. All told, almost all of the pear fruit was wild harvested – around 150 bushels. We took scion wood from four of the standout seedlings and budded them onto rootstocks planted in the spring of 2016 in our new Valley Orchard. This may be the long term legacy of the 2015 fruit year. But for now there is the cider, disgorged in July of 2016. To purchase for Thanksgiving, we’ve got 2 options…750 mL bottles and magnums. Magnums are fun and celebratory. Bring a magnum of wild harvested perry, and you'll be the life of the party. 1 magnum serves 4 and no one has to get up and open another bottle. The pear is insanely aromatic, but light and delicate. I would definitely choose this as a starter for Thanksgiving. Serve it with appetizers or snacks. Fresh fruit and brie, or some other creamy bloomy rind cheese would be just about perfect. For a light snack pairing, Autumn recommends popcorn. Ian and Jackie have been growing apples and making cider at Black Diamond Farm for 25 years now, and Solstice Still Cider is a fond return to their Yankee heritage. Like all BD ciders, Solstice is a complex blend. Two old time New England apples—Golden Russet and Roxbury Russet—dominate this cider with characteristic russet qualities of soft tannins, rich aromatics, and bright acidity. Some traditional English bittersweets—Chisel Jersey, Brown Snout, Porter’s Perfection, and Dabinett—round out the palate providing depth and structure. Every apple and the wild yeasts that helped create this cider live alongside us here on the farm. Ian and Jackie are grateful to have lived long enough to see millions of people rediscover cider and share their passion for this gift from nature! The whole BD crew gives thanks for the abundant harvest and warm autumn weather of 2015 that made this cider possible. As the year winds down and winter approaches, let’s celebrate the amazing diversity of apples that enables cidermakers to create blends that embody two continents and three thousand years of the history shared by apple trees and humanity. Stone Fence Farm is a single orchard cider celebrating just the kind of apples and relationships you find in the Finger Lakes. The Stone Fence Farm orchard was planted by Peter Hoover in Trumansburg from 1995-2000. All of the fruit from this orchard (except for a few of the trees that Peter used for other products) was harvested ripe, sweated in a cider shed, and pressed as an orchard blend at South Hill Cider, less than a mile away. Peter chose all of the apple varieties in his orchard with an eye towards hard cider production. Because of extreme weather events all of the trees have synced so that the orchard bears a crop about every other year. Color of a vintage golden gown. Very balanced and expressive. Aromas of wet slate, rich soil, breadcrust, starfruit, lychee, with a mouth-watering finish. Stone Fence Farm pair well with your main dishes, and can help folks pick cider over a still, white wine. Barrel Rye features Golden Russet, Margil, Tremlitt’s Bitter, Yarlington Mill and Dabinett. Golden Russet is a major highlight in this year’s cider pairings, building on the bounty of 2015. Barrel Rye highlights this dual-purpose apple (used for both eating and cider) and makes great use of its fruit-forwardness. We built this cider to stand up to the mixed, savory flavors on the Thanksgiving dinner table using heirloom and bittersweet apples and the smokiness barrel aging and creamy bubbles of traditional method, disgorged on-farm by our family-based crew. We were very fortunate to have such a plentiful harvest last year in 2015 and to harvest enough fruit from these two exceptional cider apples to make this dual-varietal cider. It highlights Eric Shatt’s all-time favorite apple- Porter’s Perfection. Porter’s Perfection is a late season English bittersharp loaded with tannins and bright acidity, while holding all the classic bittersweet apple characteristics including earthy, herbaceous aromas, dense fruit and incredible texture and mouthfeel. This combines with the opposite side of the cider spectrum when blended with Golden Russet. Golden Russet’s tropical fruitiness, honey comb, viscosity and weight creates a cider of our dreams! All this fruit was organically grown and grown by the Redbyrd family at their farm and from a few trees on a friend’s farm in Hector. Bone dry and bottled conditioned, it is the perfect cider for this celebratory season that we are entering. Enjoy! For the past two days- Wednesday and Thursday- I've been swept away by what I've come to call a core-mission experience. Simran Sethi came to town to share her book "Bread, Wine, Chocolate: The Slow Loss of Foods We Love", which we carry here at the Cider House with pride. Simran's book focuses on agricultural biodiversity and how this affects flavor, sense of place and food stability. Among other things. There's a lot out there to read about both Simran and her wonderful book, and my aim is not to repeat that necessarily, but to continue to share with the Cider House and Good Life Farm communities how this kind of reading, writing and discussion circles back to spark our passion for what we do here. Please do check out Simran, "Bread, Wine, Chocolate..." and find her where you are! First stop- Simran's lecture on Wednesday night, brought to us courtesy of the Cornell Plantations Fall Lecture Series. Sitting in the audience was the first time in 2 months I'd sat and sustained a quiet, listening pose. September-November in the cider world is pants-on-fire, between the bookends of FLX Cider Week (Oct 1-9), NYC Cider Week (Oct 21-30), and all the harvest, pressing, fermenting, tasting room hosting, etc that goes on at our farm in a busy Finger Lakes fall. These times are critical to our business and we do our best to keep up and provide our customers and employees with a truthful and rich experience to keep us all grounded. It is a time to say "Yes" and take every opportunity to get out into the world with cider, with ginger, with beef, before we all hunker down for a northeast winter. In the midst of all this comes Simran and her rejuvenating message, and so back to the Statler Auditorium. I find a direct and essential connection to Simran's work in the frequent decision making here at Good Life Farm, and continue to be reminded just how far we've come on the strength of our belief, our willingness to compromise and our youthful naivete. 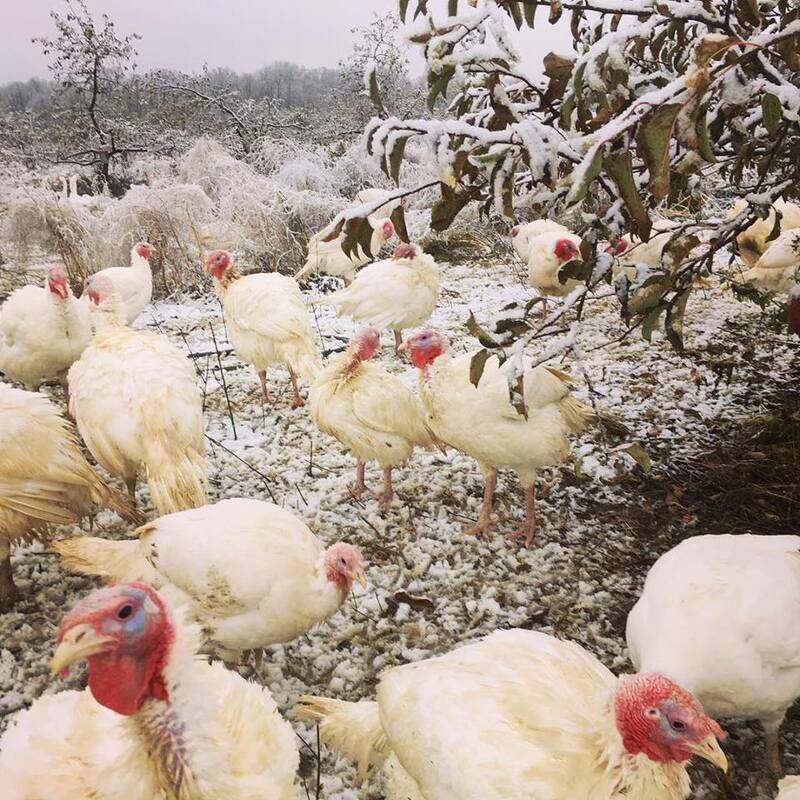 When it came time for Eric (Redbyrd Orchard Cider) and me to talk, I realized that despite being there ostensibly to talk about cider and preserving apple varieties, I could easily discuss many farm conundrums, and chose to illustrate the painful decision around turkey breeds we faced each year. Quoth one of our mentors regarding heritage breed turkeys "they will ruin your high tunnels, they will ruin your marriage, they will ruin your life". And so, uncharacteristically, we chose NOT to take on the challenge of breeding and raising only heritage breed turkeys. In actuality, the minute the broad breasted whites and bronzes hit our farm we found them to be active, curious animals who didn't at any point become catatonic on their way to processing weight. When holding up the permaculture ideal and trying to carry this biodiverse torch, each compromise that involves a nod back to industrial breeding seemed like a huge burden to bear. Except, it was really hard enough. On the agricultural side organic, day-range turkeys moving throughout an orchard and asparagus polyculture is a beautiful, productive system. On the financial end, the intense labor and high grain prices produce an endless series of question marks, so many that this year we took a turkey-raising break. Luckily for me, I wasn't at Simran's talk to problem solve these issues as much as acknowledge and contemplate. On Thursday, we followed up the Wednesday Plantations lecture with an intimate Community Writing Circle, Discussion and Happy Hour here at the Cider House. This workshop was among a few we've held that are small, free, and content-rich without having a sales focus and they truly light my fire. We sat in a circle, sipped hot toddies of sweet cider and Pommeau, and followed Simran through her process for writing about food (read, love) and were challenged to write our own food story. Precious time spent in a more restful and thoughtful period that I could have wished for in this hurly burly season. Again, I found myself writing about the food aspect of Good Life Farm and our challenges in growing food in such an idealized bio-extensive system. I continue to realize how this farm is intended for the second generation of farmers here, who will enter into a land base of well established trees, a solid herd of cattle, and maybe some clarity around raising poultry. At this moment, a lot seems unclear and in flux. The Cider House has made it possible to run this as a full-time family operation but still entails 80-90 hr work weeks, which leads me to wonder where that second generation is going to come from. Instead of just worrying, the past two days of reconnecting to my personal "why" for all of this provides me with a tool for analyzing and discussing it with myself, with Garrett and with our team. And, in the midst of the exhaustive season of harvest and cider sales, I am awake! Thank you for the visit, Simran. Looking forward to sharing more on this topic. Farmers have the reputation of being able to do a little of everything. We've generously borrowed from that assumption in the past year of running the tasting room and restaurant. But we need to know: How are we doing? *Email Melissa your thoughts! * What do you think about table service on Friday nights? Mother's Day brunch and craft market? Le nouveau Creperie? Anything else? Comments gratefully accepted and feedback valued! Friday's dinner (April 8th), marks a turning point that comes to many young businesses- staff changing. In our case, we bid adieu to Chef Katie as she moves on to new adventures in FLX cooking. Please join us for Dinner and Music with Long John and the Tights, and raise a glass to Katie. We wish her well, and expect that we will continue to discuss FLX food as the years roll by- we've known her since the day before we started our farm, when Katie was the Full Plate Farm Collective Coordinator, and look forward to the next version of our relationship. More soon on our plans for the long term... but please do know that Friday dinners will continue, with fabulous music and the FLX food we grow and love. Chef Brud Holland will guest chef for us until May, when we release a new menu!